In just under two weeks approximately, 2.2 million people will flock to the shoreline of Chicago with the bulk of that crowd converging on North Center Beach, the epicenter for the 2011 Chicago Air & Water Show. The annual show, in its fifty-third year, is "the largest FREE admission air and water exhibition of its kind in the United States" according to the Mayor's Office of Special Events. To aid new and experienced Air Show goers alike, we have updated and published our annual "Ultimate Guide to the Chicago Air & Water Show". The guide provides an overview of the wide variety of both civilian and military acts that will be performing at this year's show. The show will be headlined by the U.S. Air Force Thunderbirds who will thrill the crowd with precision aerobatics flown in their F-16 Fighting Falcons. The U.S. Navy will be represented by the Navy Leap Frogs skydiving team and performance and the F/A-18F Super Hornet Demo Team. The Golden Knights will dive into the show to represent the men and women of the United States Army. Our guide provides a full list of military acts that will perform throughout the day. In addition to the military acts there will be many great civilian acts. 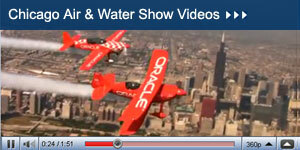 Sean D. Tucker performing in his Team Oracle Bi-Plane is always a crowd favorite. Airshow regulars will not be surprised to see the return of Lima Lima Flight Team, AeroShell Aerobatic Team and Firebirds XTREME, all of which have become regulars at the Chicago Air & Water Show. New this year are two civilian acts: Matt Chapman in the Embry Riddle Eagle 580 (http://www.myflightblog.com/matt-chapman-at-the-chicago-air-water-show.php) and Dave Dacy in the Super Stearman. Let's be honest, 2.2 million people in the same place can make for a long day no matter how exciting the entertainment overhead. Finding a prime spot to watch the show can be a challenge. 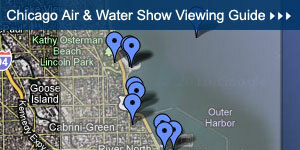 Check out our map of viewing recommendations and be sure to stake out a spot early! I read your post about Chicago Air & Water Show. I think it is best water show in Chicago. This Show is presented by the City of Chicago. Such a it is the the largest FREE show of its kind in the United States.